This article DISCLAIMER: File mirrors are neither guaranteed to be working nor to be virus or trojan free! Touhou Wiki cannot be held responsible for any damage these files may cause to your computer. This article holds info about existing tools to extract or modify the data of the Touhou Project games. All of the tools are built for Windows only, however some have source code included and therefore it might be possible to get them to work on other platforms. If your computer has trouble recognizing Japanese words related to Touhou, see the Input Method Dictionary. For more information on the inner workings of the games, see the Technical Information pages. Generic GUI tool for extracting data of various game archives. Command-line toolkit for extracting, modifying, and repacking the data of the Team Shanghai Alice games. th*.dat - Game archives (Extraction and repacking). *.anm - Image archives and animation data (Extraction, conversion to PNG and repacking). *.ecl - Stage scripts (Containing enemy layout and danmaku patterns) (Dumping and recompiling). *.msg or msg*.dat - Dialogues (Dumping and recompiling). *.std - Background scripts (Dumping and recompiling). Collection of command-line tools to decompile and recompile the data of Mystic Square. *.std - Stage scripts (Containing enemy layout, danmaku patttenrs, background section layout and scroll speeds) (Decompile/Recompile). *.map - Background section definitions (A section is 5 rows of 24 tiles) (Decompile/Recompile). *.mpn - MPTN Background tile bitmaps and palettes (Decompile/Recompile). 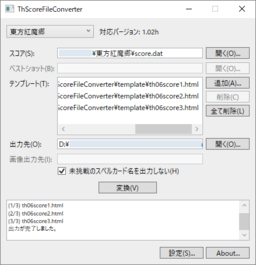 Console application to convert anm files in Touhou dat files to png images. Compresses the original lossless BGM used by the main series games to Ogg Vorbis. Saves (depending on the selected quality) up to 80% of a game's disk space without a noticeable impact on game performance or music quality (for most people). Proxy DLL implementation, no game files are modified. Compatible with every present and, most likely, future version of the supported games. Fixes the crash on the in-game pause menu caused by a non-existing BGM file. This bug appears in every Team Shanghai Alice game from Perfect Cherry Blossom on. This fix can also be used to play uncompressed games without a BGM file. Puts all of your Touhou games in one program for convenience. Can run any official Touhou game. Add fan-made games and mods. Open any game's folder and AppData folder. Run PC98 emulators to play older Touhou games. Download replays and extract them to the appropriate game folder. Tool for generating text and HTML summaries of score files. Generic tool for extracting data of various game archives, including some fangames, as well as DxLib format archives. 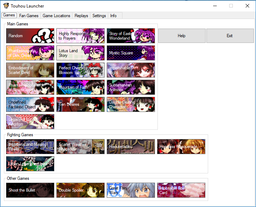 Also supports additional games (all present and most likely future Windows-era Touhou games since 1.5.0 beta 2 / 1.4.6) via title files. The download page includes a collection of links to title files. 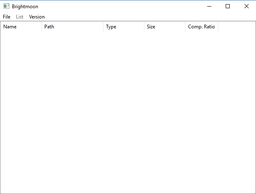 Drag a BGM file (usually thbgm.dat) onto the ThbgmExtractor.exe file. The program will ask you for the output directory and then start the extraction process. 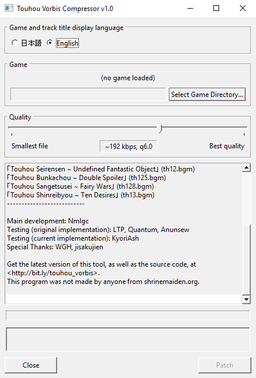 Also supports additional games (all present and most likely future Windows-era Touhou games since 2.0.3) via title files. 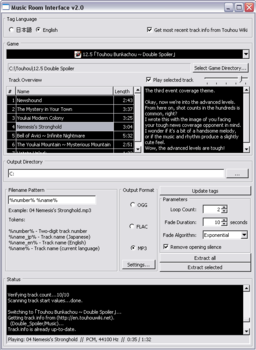 Easily understandable GUI tool for game BGM playing, extracting and tagging. Built-in Ogg Vorbis encoding. Can create chained bitstream output files. Exclusive support for games compressed with the Touhou Vorbis Compressor. Support for new games can be added by downloading BGM files created by others or yourself, instructions on the folder "bgminfo" are included. Newer games are linked here. Tool for playing music based on visual context-cues. 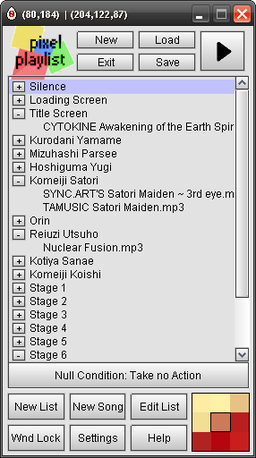 Ability to assign a playlist containing any number of songs in place of a BGM track. Flexible configuration -- you could give mid-bosses their own songs, for example. Configurations are completely user built; if a game isn't supported, you could try building a configuration for it yourself. FBPLAY - A player that supports a wide range of games including TH06-TH11. Unofficial versions support up to TH13. There is a common format for files that store information about BGM names and their positions in thbgm.dat files. The usual naming convention is titles_thXX.txt. Note that older versions of software may not fully support TH13 title files due to the reduced sample rate for spirit world versions in that game. The download page for Thbgmextractor includes a collection of links to title files. 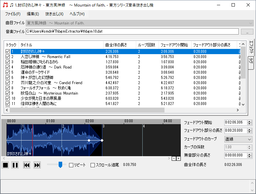 東方シリーズ曲入れ替えツール has an alternative list for individual wav bgm files, extracted from data file using a ripping tool (th06 to th10). あま茶の多アカ的思考 has files for th13 trial, th13. 迷い家の白猫 Blog has files for th14 trial, th14, th143, th15 trial, th15, th16 trial, th16, and releases new title files shortly after the corresponding game release. Various essential Windows 10 fixes. 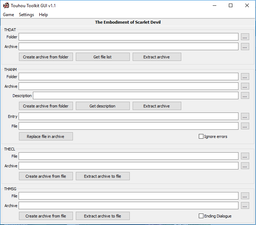 Touhou 6 EoSD unlimited FPS fix, Touhou 7.5 IaMP crashing fix, and more. Extract files into game directory. Enables exclusive fullscreen instead of (borderless) windowed fullscreen on Windows 10. Reduces input delay when used with the Vsync Patches. Enables compatibility with various screen recording and streaming software (e.g. Open Broadcaster Software). Enables compatibility with various third-party graphics tools (e.g. MSI Afterburner, SweetFX). Touhou 7.5: Character sprites are blurry due to poor sprite filtering. If this is annoying, use AnKor's converter instead. Reduces input delay (game responds more quickly when a button is pressed). For EoSD, please remember to install (and run!) the game in Japanese locale, or the filenames will be gibberish and the patch won't be able to find the main program. Failing that, you can use vpatch_th06_unicode.dll instead of vpatch_th06.dll, and rename the program to 東方紅魔郷.exe. An advanced DX8 converter that enables optional high-resolution rendering (e.g. native 1080p) and other graphical enhancements, but has notable known issues. Similar features to the DX8 to DX9 converter (Windows 10 fixes, etc), but converts to DX11 (feature level 10.1). Enable high-resolution rendering, anti-aliasing, and anisotropic filtering. Alt-Enter shortcut to toggle fullscreen. Additional input lag and higher graphical requirements compared to the DX8 to DX9 converter. When playing at high resolutions, graphical artifacts are visible throughout the interface and around some in-game sprites. Incorrect graphics in some games (e.g. invisible trees in EoSD stage 3). Allows games to be played in an arcade-style vertical-oriented resolution. See the Vertical Play page for a detailed usage description. Another tool allowing games to be played in a vertical-oriented resolution, with more games supported and customisable positioning for HUD elements. This mod will make the bullets go faster or in higher amounts, making the Touhou games harder. It is not a selectable option in the menu, and every difficulty will be affected. Compatible with every present and, most likely, future version of the supported games. 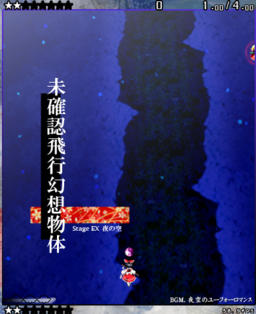 Reads the memory of Touhou games and gives a display of the game's inputs. Displays the inputs of replays as well. Does not depend on input device or setup. Somewhat configurable, will likely support future games. Changes the sizes of bullets to approximately match their hitboxes. Allows characters to have a voice. See the Voice Mod page for a detailed usage description. Replaces all the images in EoSD with cleaner, higher resolution images. The sprites have also been updated with those from the newer games. Read the readme before installing, as it contains some important information. This patch is packaged with the English translation patch as well. Displays a visible hitbox on the character sprite when the Shift key is pressed. Hitbox is invisible when Shift is not pressed. Allows players to save replays from Practice Mode stages, a feature that was first officially introduced in PCB. Binary patcher to fix several audio glitches in Imperishable Night's BGM file. A boss rush modification to TH11. Removes stages, bombs and continues, and every player faces Satori's entire arsenal, along with other quirks. Created as a challenge mode and a means to boss practice. Binary patch to fix the score display glitch that occurs when score exceeds about 2.14 billion. A boss rush modification to TH12. Removes stages, bombs and continues, along with other little quirks. Created as a challenge mode and a means to boss practice. (Only for Windows Vista and Windows 7) Adds a code to the th13.exe so the game can play on Windows Aero. It does no affect to the game whatsoever. Simply replace th13.exe with the one in the download link. Command-line tool to extract data from the *.ac6 files. Based on salvaged data of old Touhou Tools Wiki. This page was last edited on 23 April 2019, at 20:40.